If you are interested in the freshest seafood to be found in Stamford, visit with John and Paul in our retail store. They will help you pick out fish from our selection of fresh Atlantic Salmon, Farm Striped Bass, Bay Scallops, Sea Scallops, Caviar, Swordfish, Pompano, Mahi Steak, Fresh Tuna, Pacific Cod, Monk Fillet, Jumbo Shrimp, Maine Crab Meat, Pasteurized Crab, and Blue Point Oysters. 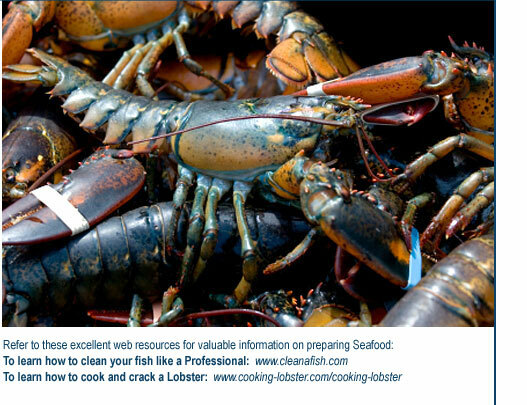 Love fresh lobster? At New Wave Seafood, you will find two 10,000 lb. capacity lobster tanks full of fresh lobster in all sizes from one pound to as large as five pounds. Pick the one you would like and they will catch them for you. Don't forget to checkout our selection of grocery items to complete the preparation of your meal. If you don't have time to do your own preparation, we will steam or grill your seafood for you! New Wave Seafood will steam lobsters for your convenience and prepare a shrimp or seafood platter year round, for any occasion!